Doubts have been raised over an excavation in Monmouth that was said to have possibly unearthed a bronze-age longhouse. Welsh heritage minister Huw Lewis said remains at the Rockfield Road site are now thought to be from a later period, and are unlikely to represent the foundations of a house. But his comments in a letter to Monmouth AM Nick Ramsay have sparked anger from Steve Clarke of Monmouth Archaeology, which has spearheaded work at the site. 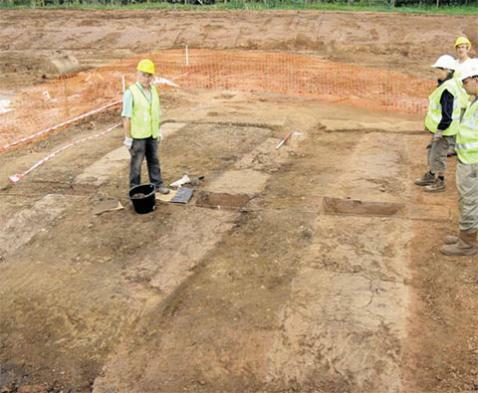 Earlier this year archaeologists working at a dig at the Parc Glyndwr housing development said they may have found the remains of a "longhouse" dating back to at least the Bronze Age and possibly as far back as the New Stone Age. But Mr Lewis said: "The three, parallel clay-filled trenches are cut from a higher, and therefore more recent level, than the Bronze Age surface in which they were first recognised. This means that they are later than that period." No finds are associated with the fill of the trenches, and the absence of any finds or food waste makes it unlikely they represent the foundations of a house, Mr Lewis wrote. "The actual date and function of this site remains a mystery, which may not be solved within the confines of the current excavation," he said. He added that Cadw, in the absence of any certainty about the date or function of features on the site, couldn't consider the site for scheduling as an ancient monument. Mr Lewis said Cadw officials were in regular contact with archaeologist in charge, Steve Clarke from Monmouth Archaeology. Mr Ramsay said he's asked the minister to intervene to protect the site until it is known what is there: "It will be tragic if something of possibly unique importance was lost before we really knew what it was." Developers Charles Church East Wales had rearranged work to allow for a full archaeological exploration of the remains, which were found during the digging of an attenuation pond. Panel the man who has spearheaded work at the dig Steve Clarke of Monmouth Archaeology, said the site is Bronze Age and a burnt mound from the era had been found. He said foundation slots had also been discovered that may represent a "massive" structure which may be a longhouse. Mr Clarke said: "I'm very concerned that an officer from Cadw should go on a site for five minutes and decide that our reading of everything is wrong. "I think it’s silly and its damaging to our professional reputation. This is one of the most important sites I've seen in 30 years." A Cadw spokesperson said: "Differences in interpretation as investigations continue are not unusual amongst archaeologists and it is no reflection on Mr Clarke's professional expertise or integrity that his interpretation differs from other archaeologists who have seen the site." She added that Cadw was satisfied Monmouthshire council and the Glamorgan-Gwent Archaeological Trust can continue to ensure the condition of planning that required the archaeological work is properly discharged.